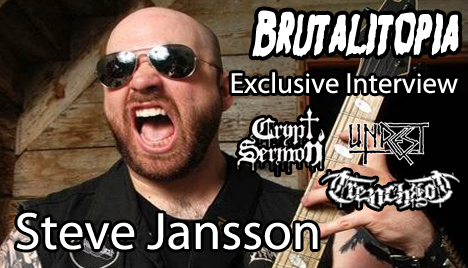 I talked with Steve Jansson from Crypt Sermon about epic doom metal, Dio worship, and the press reaction to their debut LP Out of The Garden. I also spoke with him about recent exploits with death metal band Trenchrot and grindcore band Unrest. More with Steve after the jump. Before we talk about the music the first thing that caught my attention as a metal listener was the artwork. Was that something you had made up? Brooks painted that actually, he had a real clear vision on how to put our sound into a visual and if you see the album art you know what it’ll sound like. On my first listen through I had a real feeling of Candlemass’ Nightfall both in look and feel, the perfect combination of the art and music which it imitates well on both ends. We wanted to keep it classically oriented, for our first album we wanted to lock in on this style of metal and keep it classic. Where from the epic doom school did Brooks get his vocal style? When we started it was James and I and we were just jamming and writing these songs in the car, no band just the 2 of us, riffs and guitar solos. We didn’t who we’d be working with. Brooks we initially asked to play bass and he was in since he and I had played together for years. We still had no idea who the hell would sing. I had heard Brooks sing more acoustic and country type of things and he had a really great voice and he had expressed interest in being a rock vocalist. I guess you could say he comes from the school of Dio in terms of metal voice. I asked him if he had wanted to give it a shot, even though his first time singing in that style was on our demo. I’m a little shocked that that would be his first time singing like that since, especially in an epic doom metal band the vocals are such an integral part of their sound. I had a hunch that he’d be really great at it. Even when looking at the demo, he cut his vocals separately and I was like wow. Being a huge Ronnie James Dio fan and listening to your track ‘Temple Doors’ and hearing the iconic “foo foo” made me very happy. It fit. It was right there for you. If you got it, great, if not it didn’t take anything away from the music. People don’t usually mention it but the Dio fans think it is a cool nod. Like your saying about him (Brooks) Dio wasn’t a classically trained singer either. Yeah, he was doing it for his job. How have you felt about the press reaction to Out Of The Garden? It’s been pretty unbelievable. I was a little taken back. I think we all felt that we made a great heavy metal album. We didn’t expect it get the attention it was getting. I guess the timing for it must have been right. Doom has been pretty popular over the last few years, but not a lot of bands have been doing the epic doom thing. People are just eating it up. We’re really excited. The really enthusiastic fans of the old school are enjoying it and knowing the roots and listening to it all I can think of is a combination of Dio and Messiah Marcolin. We definitely know that bands like Candlemass and Solitude Aeturnus are the basis of our sound. We also know that you can’t be better than those bands while trying to sound like those bands. Especially with a lot of the doom lately has been stoner and sludge stuff, which I’m a little sick of. I feel like the songwriting has gotten lost, especially when your album is boring. We like great songwriting since we’re all just metal heads anyway. We tried to make this a more cohesive listen and arranged the songs in a way that they flow together, are separated and build some nice momentum. That’s what we were going for. A well put together album. Veering off from Crypt Sermon for a moment, Necronomic Warfare was a phenomenal album last year and to release the Unrest Grindcore album on top of that. You’re paying homage to tons of styles of music and you seem to do all of it well. Any particular death metal albums that were the impetus for that? Asphyx’s The Rack, Nihilist, Left Hand Path, Bolt Thrower, old Morbid Angel but I don’t know that it was any one particular album. Lots of bands are doing the Swe-death sound lately. Just really basic chalkboard death metal. You can’t beat that. You have both the European and US sound going for you, playing to both fields. That’ll work for you. That’s what a lot of people mentioned when about it. We managed to blend the European style and the US style which wasn’t deliberate but more of a natural thing. We really just took elements of both that we liked. That’s what Necronomic Warfare is. With Grindcore it sounded a lot like Nasum to me. Unrest started with Chris and I as early as 2006 and we started writing these grind songs and the initial intention was to make a band sound like Nasum. We recorded some demos and started playing and then split for a year and reformed. Recorded some material that would become Grindcore. We had issues with the mix and we couldn’t fix everything and Chris agonized over it. Last year he dug up the files and fixed it and then we cut the vocals last year. A really personal record for all of us. It was the first time I had really learned to write songs, which is funny because it was grindcore. We all became really great friends through that. Would you say that that acted as some form of closure or something to show for with that? Exactly. I thought that monkey would be on our back forever. We never thought the damned thing would come out. You mentioned that Trenchrot was strictly a studio project. What about Crypt Sermon’s potential for a tour? We’re trying to do a short tour for this fall. We all have jobs. Brooks just had a baby too. We want to tour as much as we can. How did Enrique get tied in to the drumming duties? He’s been a friend of mine for a long time and we had never played in a band together. He was the first person I thought of. I think it’d be cool to be in a band with him. All just a matter of giving him a call. Well that’s how this interview happened right? I’m really happy that you guys are doing well. Also happy to see the album art rolling out as t-shirts. We might have flags of that as well. It’s been a real pleasure talking to you about all of your projects. It felt like you put a tons of effort into the music the art the soaring solos and riffs.